For my printing and framing business I often get asked for a mountboard that has a white edge rather than a brown edge so I thought I would write a small post discussing the basic difference between Whitecore and Creamcore mountboards. 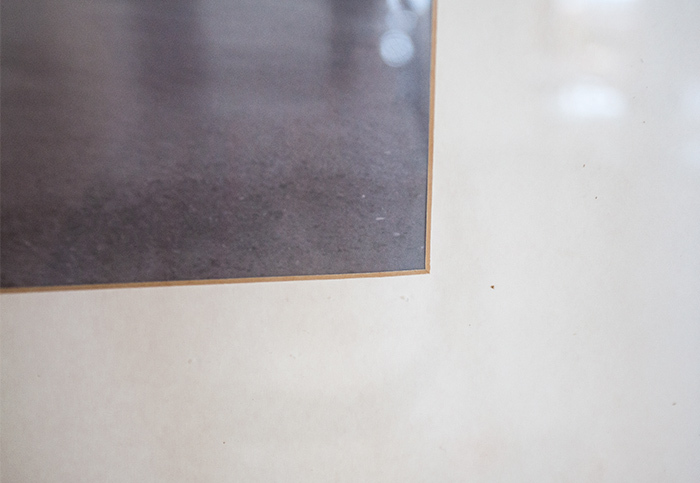 A mount or mat as it is refereed to in some countries is actually used to protect the artwork by separating it from the glass in a picture frame. It also has the added benefit of decoration, but it’s main purpose is to stop the artwork from coming into contact with the glass. Condensation will form on the glass and if the glass touches the artwork, the artwork will absorb moisture, will cockle and mould can also form. Mountboard varies from each manufacturer, but most manufactures will offer a few different grades. Cream core board is the cheapest, the actual cream colour refers to the middle of the board and is not necessarily cream when cut. The bevel exposing the core even if white or pale ivory when cut will discolour and turn a creamy brown colour. This does not usually happen until after a period of time, usually a year or two. This board can also contain impurities that can cause acid burn to the artwork. The acid inside the board leaks out from the board and can damage the artwork. Above is an image I recently had in for reframing. The bevel from the creamcore had turned brown and the images was full of dust under the glass. The customer informed me the image was purchased from a photographer only three years ago at considerable cost.Whitecore board is similar to the creamcore but has the lignin removed so that the core is white and stays white. The board itself can still damage artwork and is not a conservation standard mountboard. Conservation Whitecore mountboard contains no recyled pulp. The lignin is removed so the core stays white and is lined with conservation backing and facing papers.The reason creamcore board is often used still is purely down to price, it costs a fraction of the price as conservation mountboard. Most of the ready made frames purchased off the shelf will usually contain mounts cut with creamcore mountboard. For me as a photographer and as a framer it’s an easy choice, I would always use a conservation whitecore board as I want my images to still look good in years to come. Even if I was using ready made frames I would still replace the mounts to conservation whitecore ones. As a photographer it’s amazing how many customers will suddenly return for another order years after purchasing an initial image or as a result of someone seeing an image framed elsewhere, whether at a friends house or displayed in a Hotel or office etc and I know if the frame or mount is not at it’s best this would no longer be the case. Good quality artwork is framed on a wall is fantastic advertising for futures business and representing the quality of your goods.